This is one of my original recipes that I’m pretty proud of. One night I had some friends coming over for dinner and I didn’t have a lot of money to spend on ingredients so I whipped this up with what I had around the kitchen. 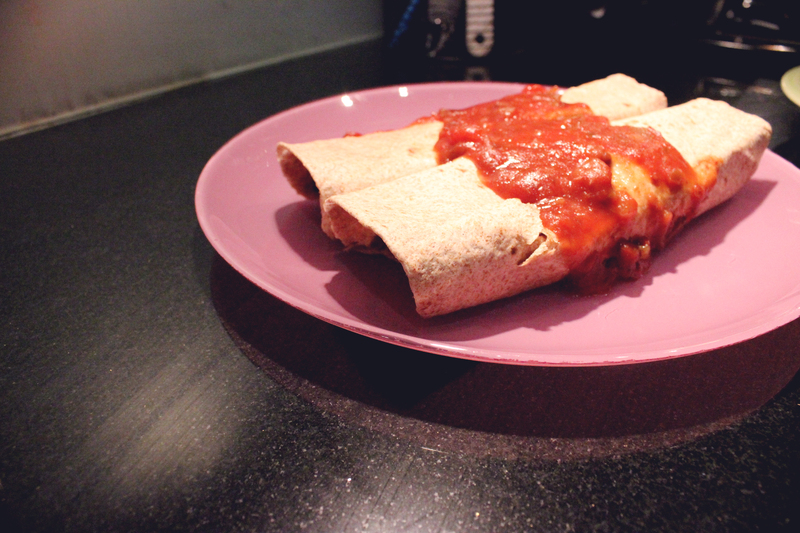 I recreated this recipes again last week (with a little more intention this time) and it turned out just as great. -A jar of salsa. I used Mrs. Renfro’s Raspberry Chipotle salsa this time, which complimented the sweetness of the sweet potatoes really well! -Sour cream (I’ve done this vegan- with Tofutti brand or you can just use regular sour cream). 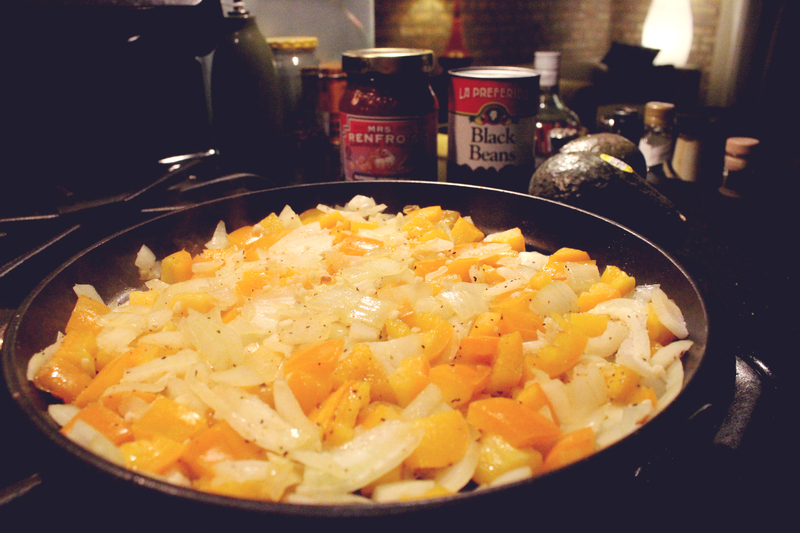 I start by cutting everything up, the peppers, onion and sweet potatoes. I fry the pepper and onion with cumin, garlic, cayenne and a little olive oil. While that is getting nice and caramelized I boil the sweet potato. I do it in a wok so that I can later use that to mix together all of the enchilada filling. After the sweet potato chunks are softish and the peppers and onions are cooked to your satisfaction, strain the water out of the wok and mix all ingredients together. Add the black beans, sour cream and about 2/3 cup of salsa to the mix at this time too. I go pretty light on the sour cream, but if you want them to be creamier you could add more and add cheese. I honestly think they are great without it so I’d prefer to skip the extra calories and fats. 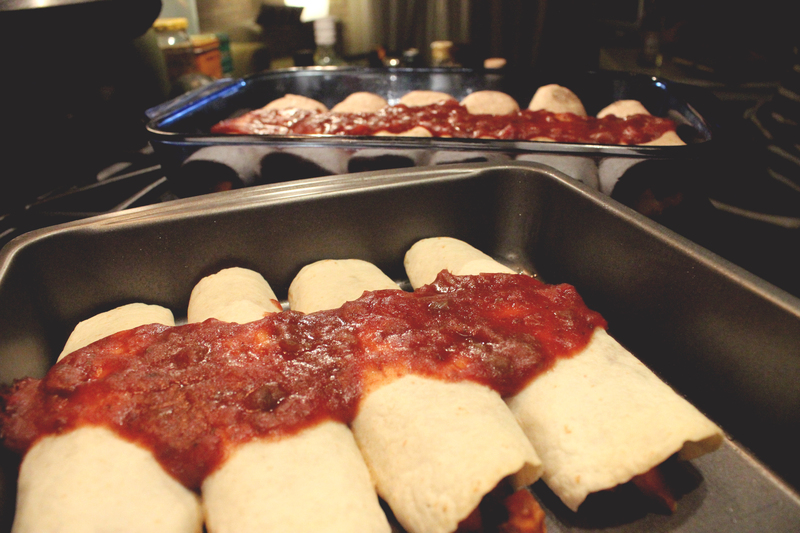 Grease some pans and roll up tortillas with about 3/4 cup of filling in them. I used almost the whole remainder of the jar of salsa on top. Bake for about 15 minutes at 350 degrees or until the tortilla is nice and crispy. Good as a stand alone dish or with some sort of salad on the side. Garnish with avocado for a little extra tastiness!